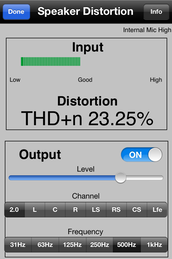 Speaker Distortion lets you test loudspeaker drivers for THD+n. This is useful both to measure the distortion that a driver produces at a given frequency, and also to compare drivers to look for damage. A damage loudspeaker will show measurably higher THD, long before you can notice it with your ears. Test studio monitors after a heavy session, or test rental speakers before they go out and after they are returned. To use this app, feed the output from this device to a speaker that you want to test, through an amp. The quieter the ambient noise level, the better the results will be. Select a frequency, and turn on the output. Hold the mic about 1-2 feet (0.5m) from the driver, and adjust the level to get a reading in the center of the level meter on the app. Read the distortion in percent (%) THD+n. Lower values are better. Especially useful to compare drivers that should be identical, or to do routine maintenance, to watch for distortion increasing, which is an indicator of a problem with the driver. 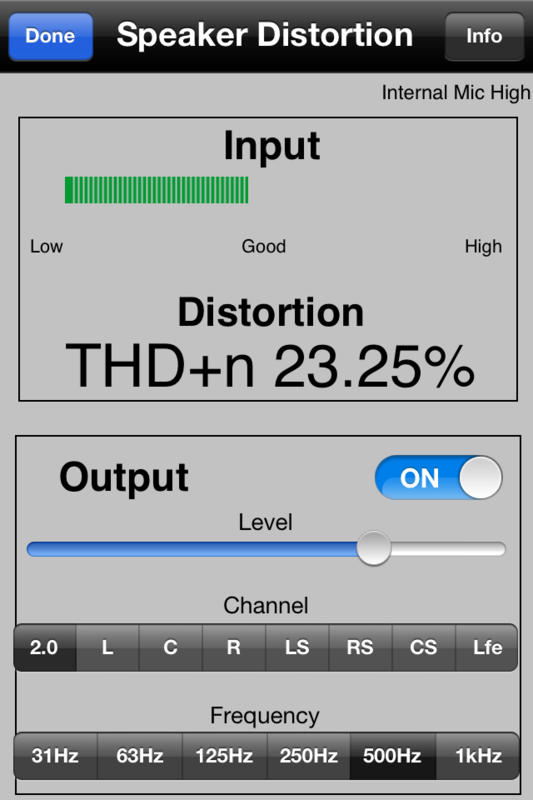 To use with surround signals, select a single speaker, and test the distortion at 1-2 ft (0.5m) from the speaker. Test the subwoofer with 31, 63, or 125Hz, and test the LCRS speakers with 250Hz and above.